Panel Blinds provide the ideal solutions for covering large windows, sliding doors, and also make an ideal room divider. A tracking system with individual panels that glide and stack behind each other. When open, the panels stack neatly behind one another allowing maximum light into the room. Our Panel Blinds system provides a contemporary method of obtaining privacy and sun protection in both domestic and commercial installations. This new and innovative shading solution for large winds, sliding doors, looks fabulous in ultra modern or traditional interior design schemes. These tracking systems will cover a window/door opening of up to 3600mm, with a minimum of 4 panels up to a maximum of 6 panels in either a PLAIN OR TEXTURED style fabric panel. What makes the Panel Blinds so unique is the wide panels that effectively reflect and filter daylight. When open, the panels stack neatly behind one another allowing maximum light into the room. Sliding the panels into the closed position creates a complete fabric screen providing light control and increased privacy. *block-out, light filter & sunscreen fabric: set the tone of the room with colour, mood and light control. *tracking system: the benefit you get from the roller mounted carrier system is a light weight blind that is easy to operate. The track is very slim and discrete. *removable panels: you can change the colours of your panels to give your home a new look simply and easily. whenever the mood takes you. 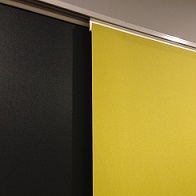 1 BRAND NEW Extendable Transition Panel Glide Blind. Material: 100% Polyester. Colours : Cream. Sizes : Extendable 200-360cm width x 230cm Drop. Blockout effect. 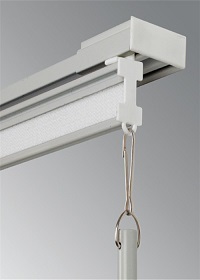 Modern & Elegant and Best solution for Sliding door. Easy installation. Great for uncluttered look. Simple Operating mechanism. Come with all the fittings and easy to follow Instruction. Low Maintenance. Each Panel is 65cm wide and they overlap for efficient light control and privacy..